Car owners spend big bucks to have their cars painted but then se 50 year old emblems! 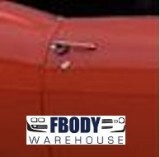 Replace your emblems, body decals, various specification decals and even windshield stickers with new replacements from Fbodywarehouse. You can make that 1967, 1968 and 1969 Firebird or Camaro stand tall once again!